I feel like I should simultaneously apologize and say "You're welcome" for posting this recipe. It is so bad but so good at the same time. Bad/good that it is prepped and ready in under an hour. Bad/good that it is sinful and decadent. Bad/good that it makes a lot of biscuts. So you can hoard it all for yourself or share the wealth with several people. 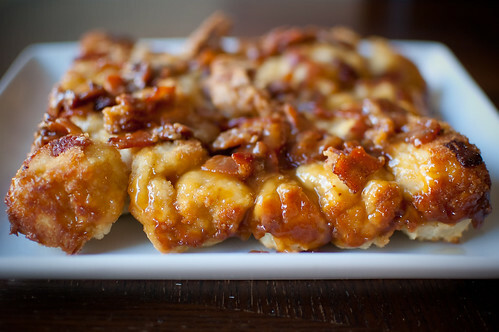 It's sort of a cross between an upside down cake and monkey bread. The maple-bacon mixture is poured into the bottom of a pan, and then biscuit dough is dropped over it. After a quick bake in the oven, it is inverted onto a platter and then served monkey bread-style. Just grab a biscuit and chow down. Some of the bacon-maple mixture did stick to the pan, but I just scraped it off onto the biscuits. I do think it would have been better to have lined the pan with parchment though. I've added that step in my version below. I think this would be a great treat to make if you are hosting guests in the coming week. I would say you should make it Thanksgiving morning, but I personally try to eat light and healthy for breakfast - I want to save my calories for the big meal! But if you are one of those crazies (like me) who gets up early to shop on Black Friday, this would certainly be a welcome thing to come home to after a morning/night of fighting the crowds. Preheat the oven to 475 degrees. Line a 9-inch round pan or 8-inch square pan with parchment paper, and spray with cooking spray. Cook the bacon in a skillet until browned and crispy. Use a slotted spoon to transfer to a paper towel, and reserve 2 tablespoons of the rendered fat. In a medium bowl, whisk together the syrup, flour, brown sugar, and rendered fat. Spread over the bottom of the baking pan, and sprinkle the bacon evenly over the top. For the biscuits, whisk the dry ingredients together in a mixing bowl. Drop the butter into the mixture, and using your fingers, a pastry blender, or 2 knives, work it into the dry ingredients until the mixture is crumbly and has pea-sized pieces of butter. Add the buttermilk, and stir to make a sticky dough. Drop the dough over the maple-bacon mixture using a cookie scoop or large spoon. Bake for 10 minutes, turn off the oven, and leave the pan in the oven for an additional 5 to 10 minutes, until the biscuits are golden brown. Remove from the oven and immediately invert onto a serving plate. Lift off the pan and the parchment paper, and serve. Maple and Bacon is always amazing....but with biscuits? YUM! And so I have found my recipe for the UGA/GT game. Thank you Josie! 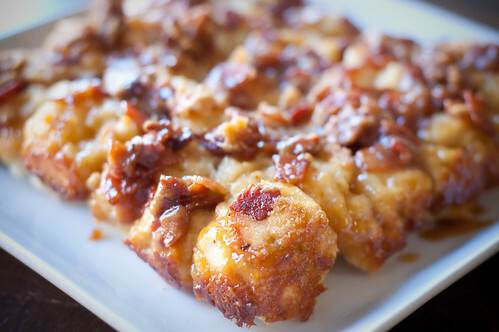 Did you just say a cross between Monkey Bread and Upside Down cake? With bacon? Hello would you like to be my new BFF?? This post was calling my name. I am a maple bacon fanatic I guess...I home cure my own maple bacon (with a bit of bourbon to boot!) and then make maple bacon jam. Thanksgiving sees Maple Bacon Turkey...see what I mean? 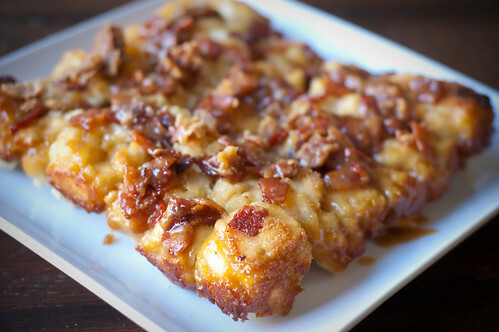 These are a must try and I have some of that bacon in the freezer; it was be a maple bacon day! Oh Josie...thank you! This looks absolutely incredible. We can't be good all the time, right? Oh.My.Word. Actually, I don't have any words...this looks amazing! DANG This will be my breakfast on Thursday. This is the greatest looking dish I have seen. I really wish I had some of this right now. Super delicious. While not exactly health food, I think it sounds utterly delicious. Can't think of anything bad about biscuits, maple and bacon! This looks AMAZING. My boyfriend is a bacon fanatic. I have to make this for him now. Also, I want to go to Barbara's for Thanksgiving and have her Maple Bacon Turkey! Holy cow (er...pig and turkey) that sounds fabulous! This sounds delicious. There's a little donut shop in New Orleans that does maple bacon donuts which are fantastic. This bread sounds like just my kind of thing. Ever tried chocolate chocolate chip bacon cookies? Those are also a great sweet with bacon. Thanks for sharing! A friend brought these to a work breakfast today and they were AMAZING! Just found this recipe today and simply HAD to make it since I just so happened to have all the stuff...except parchment paper. Thought wax paper would serve the same purpose so I sprayed the pan, lined it with wax paper, then sprayed that, too, for good measure. To cut the long story short, wax paper does not work AT ALL for this recipe. You will be treMENdously dissapointed as I was at the waste of good ingredients. If I ever made this tasty recipe again, I would use a square silicone baker and take care to double up on the cooking spray just to be on the safe side!!! I made this recipe for a bacon party I went to yesterday and it was a huge hit! So easy to make, it took me a total of 20 mins prep time. The maple mixture is pretty thick and hard to get to spread evenly in the bottom of the pan, I think a brush would be best instead of just pouring into the pan. Thanks so much for the recipe, I will keep it in my arsenal!! oh. my. god. woman, you have changed Christmas morning.